Hand embroidery has made a huge resurgence this year and with our Homespun Christmas collection we wanted to give you a hand embroidered applique look, except it will be done on your machine. The collection consists of traditional felt applique designs and running stitch designs. The felt designs are created using a blanket stitch technique with four layers of cotton thread. The four layers create a thick yarn like look and the use of a blanket stitch is a traditional hand technique. The process used to create the applique is very simple. The running stitch designs are unique as well; instead of a two-layered stitch they are created using seven layers for a thick beautiful look. 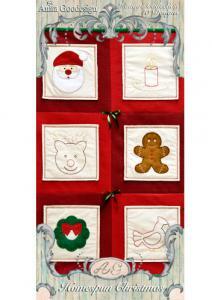 They are also created using multiple colors so when you use them with the applique designs they coordinate beautifully. The project we created for this collection is a felt layered quilt. I"m sure you will love both the project and the techniques we used in these beautiful vintage Christmas designs.